It’s difficult to think of a fairy tale that doesn’t involve food at some turn. Food carries such cultural significance, it is easy to forget that food is really, simply, a universal physical need. One could be forgiven for thinking that so long as you have enough, food is a purely benevolent and beneficial thing – it’s ‘bread and butter’, after all. However, where food makes an appearance in fairy tales, this is rarely the case. From out-of-control porridge pots to toxin-drenched apples, in so many cultural narratives, food begins as the subject of the eater; the eater then becomes the subject of the food. 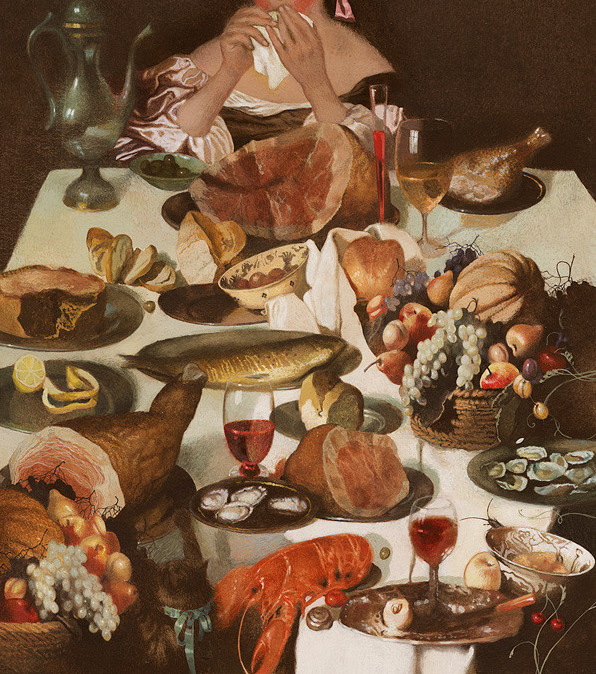 Why is it that food’s place in folkish fables must begin with temptation and descend into devastation, before characters can reach a (comfortably satiated) happy ever after? There’s a long mythical lineage for such culinary deceptions. Early examples include the creation myth, in Genesis. 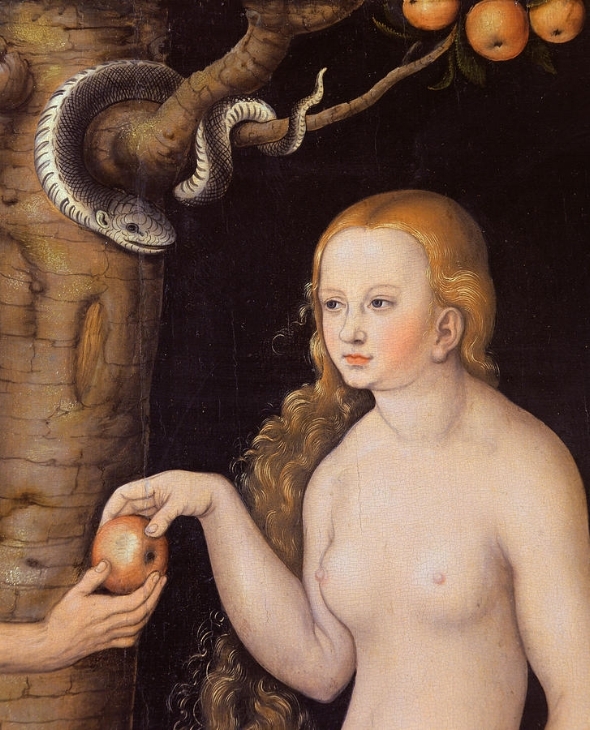 Eve, a sub-ordinate of Adam having been created from his ribs and not dust, is persuaded by a serpent (or possibly this is Lilith, Adam’s first wife) to eat the fruit from the tree of the knowledge of good and evil. What this fruit is goes unstated, and it’s likely that the widely-held idea of it having been an apple is the result of a confusion (or an early pun) between the Latin of mãlum meaning apple, and malum meaning evil. The upshot of eating the apple is Eve’s affliction with the pain of childbirth, as well as the banishment of she and Adam from the Garden of Eden, so that they can no longer eat from the tree of life. (All serpents, moreover, are henceforth compelled to crawl on their stomachs as a symbolic reminder of the evil rooted in the belly). The closeness between evil and apples is mirrored in Snow White. The Queen in Snow White longs for a child with skin ‘as white as snow, and lips as red as blood’. As the so-granted child grows - and her beauty with her - the Queen is overwhelmed with jealousy, and a desire to kill the child before the child can replace her. In the original story, this malevolent Queen is Snow White’s mother. Her replacement with an evil stepmother comes in a later ‘more palatable’ version as seen in the Disney movie. In a nod to what would have been local Slavic myths of cannibalistic witches, the Queen instructs her huntsman to kill Snow White, and bring the heart for her to eat. In Grimm’s first edition (1812) it is the lungs and liver she boils in salt before eating. Meanwhile, Snow White is wandering through the forest, where she too is looking for something to eat. Eventually she arrives at the dwarves’ cottage, and eats a little vegetables and bread from every plate. The absence of meat here emphasises her goodness in direct contrast to the carnivorous queen. Once the Queen discovers her daughter is still alive, she continues her murderous efforts, culminating in the success of a duplicitous apple. Half the apple is green and good, and half is red and poisoned. The Queen bites into the green half, thus convincing Snow White that the apple is safe to eat. As we all know, Snow White dies, and is preserved in a glass coffin until rescued and resuscitated by the Prince. The ending is slightly different in Grimm’s first edition. In this, the Prince does not kiss her, but is so enamoured of her beauty that he keeps her in the coffin and will eat only when he is stood in front of it. It is the disgruntled servants, who have had enough of carrying her around, that take her out of the coffin and inadvertently dislodge the apple, thus bringing her back to life. Another cannibalistic female character makes a central appearance in Hansel and Gretel. This time, we begin with an impoverished mother who can see no way to feed her two children. Unwilling to kill them, she asks the father to take them to the forest and leave them there (again, a tad different from the modernised edition). On finding a house made of gingerbread with cake for the roof and pure sugar for the windows, the siblings begin to eat ravenously - proving that their mother was right to fear the children would eat the family out of house and home. For the hungry children, the abundant Lebkuchenhaus (gingerbread house) signifies the witch as a false mother, who will feed them unlike their own. The children are happy to feast on the house without fear of consequence, unaware that one of them is destined to be food himself. Once they have been captured by the witch, Gretel assumes the role of mother. It becomes her job to feed Hansel, in order that he can fatten up sufficiently to make a suitable meal. Clever Gretel tricks the witch, who ends up in the oven (metaphorically becoming food) herself. Thus, the witch becomes a human sacrifice in exchange for the riches that Hansel and Gretel take from her. More horrific devouring ensues in Red Riding Hood. An innocent basket of baked goodies is allegorically transformed whilst being carried through the forest and becomes a Big Bad Wolf. The wolf then demonstrates an extreme example of oral greediness by eating both the child and her grandmother. Luckily for the child, in some versions of the tale at least, she is cut alive from the belly of the wolf, symbolically being re-born, and thus able to learn from her foolishness and avoid temptation in future. The continuing popularity of fairy tales is due, in part, to the resonance of the images, archetypes and motifs that abound in such age-old stories, one of which is of course food. At the most basic level, food represents desire. In folklore and fable, food is dual-natured, and only superficially an innocuous form of nourishment. It is an accepted part of folklore that eating enchanted food or drink will compel you to spend the next hundred years trapped in a magical realm. However, should you only pretend to eat their offerings, the enchantment will be broken - and you’ll see that you’re really sat on a barren hill, eating nothing but twigs and grass. Thus, it’s not necessarily the food itself that is evil, but the human and cultural imaginings that render it malevolent. On a more positive note, it should always be remembered that however hungry you are, if you share your last crust with an old man or woman you meet on the road, you can be assured of later success or riches. Culturally, our hunger for a happy ending is always proven strongest.